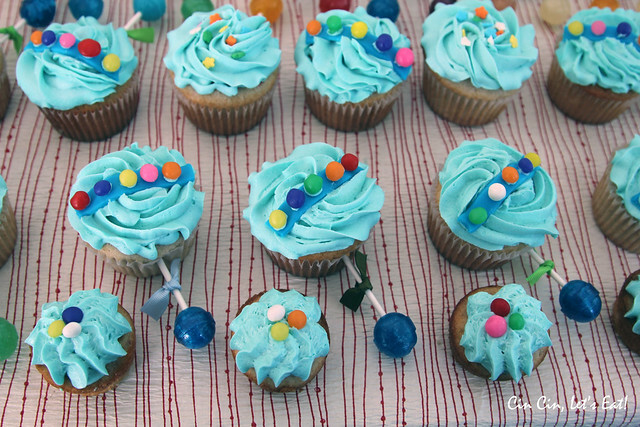 Baby Rattle Cupcakes [recipe] – Cin Cin, Let's Eat! I love to make bite-sized goodies for parties and events, and that’s why I was absolutely thrilled when our good friends asked me to cater desserts for their baby shower! I made mini fruit tarts, mini berry galettes, nutella cheesecake bars, matcha shortbread, and these adorable cupcakes that look like baby rattles. 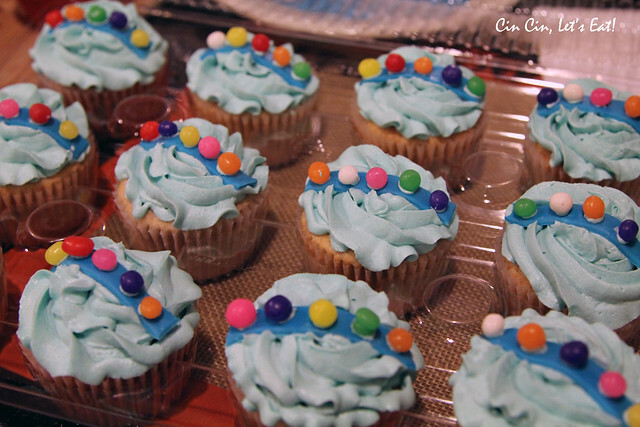 The cupcake was a strawberry cupcake with white chocolate buttercream (added baby blue food color gel). I purchased blue fondant, fruity candies (Cake Mate Fruit Imperials), and a variety pack of dum dums lollipops from the grocery store’s baking aisle. The cupcakes were baked and decorated the night before. Refrigeration makes the buttercream firmer and easier for transport and set-up, they softened up perfectly by the time the party started. Once the cupcake is cooled I piped the buttercream with a star tip. I’m not looking for a sky high mound of buttercream, just enough to cover the tops of the cupcakes. 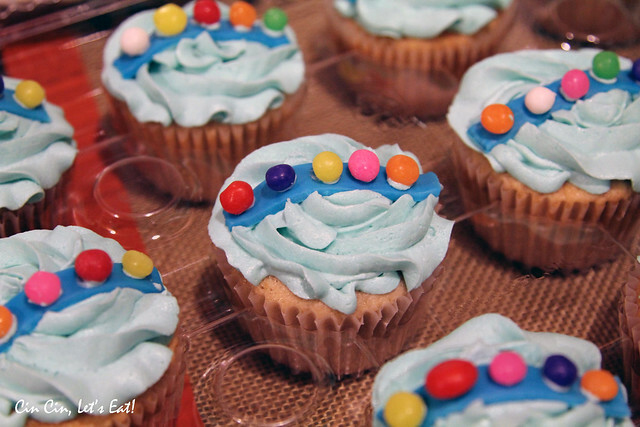 Roll out the blue fondant until 1/8″ thick, cut into strips the length of a cupcake’s diameter. 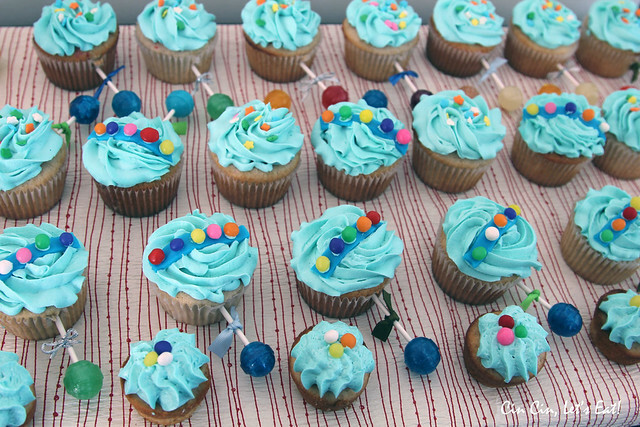 Place the strips on each cupcake, and using the remaining buttercream as glue, glue on the fruit candies. Refrigerate the decorated cupcakes in airtight containers. I tied little bows onto the sticks of the lollipops, and didn’t add the lollipops until I was at the party setting up, mainly because it’s difficult to fit the cupcakes with lollipops sticking out on the side into any kind of cupcake containers/holders. If it’s difficult to get the sticks through the cupcake wrapper, use a sharp object like a knife to pierce a hole on the wrapper, that should make the decoration process much easier.